Ravenlock Pokemon • View topic - Let's Get Started! I'd like to start a roleplay here! The sim really is a great concept, and it saddens me that it isn't being utilized... But I'm here to change that! If you're interested in Pokemon rp, message me in-world and we'll get something going! I don't really have a big plot planned, or anything. But the idea is to get a group of us to actually interact while waiting for Pokemon to spawn, and not just stand there silently. I wanna make friends, damnit! And rp is a fun way to do it! This sounds fun! I'm casual RP and like to drop in and out based on my offline schedule... I have a handful of Characters I could consider pulling out based on what sort of RP restrictions you are looking for, if any (I'd only plan to use one of the characters or two, but which ones I pick or whether I make a new one is all based on what sort of RP you are looking for). Mainly, you have a drop-in character if you need one. I also currently am living in the Bamboo Village in-Sim. I like ducking in to the Golden Dragon tea shop though in Amberville. 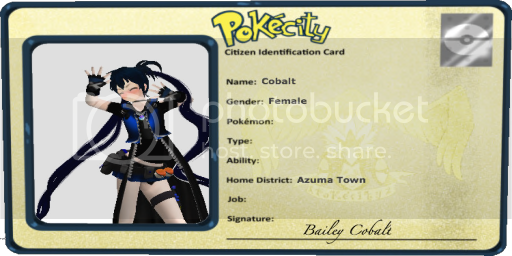 Cobalt - Kinda new trainer who is already starting to catch on. Currently she has a "borrowed/lost" Pikachu (with a familiar move set from another universe...) and a Masterball on her belt with a Latias. She's being followed around by an Absol (destined partner) and an Espeon while in the Yokai Ravenlock (alternate dimension destined partner). Most of the "alternate dimension" stuff is that she has a storyline before Ravenlock changed, with some friends. If you're looking for something strictly canon to the area and series with restrictions on Pokemon (such as legendaries or a more realistic party), I would likely choose a different character. She doesn't talk about the multiverse stuff at all IC unless the group is strictly the characters from that plan, and she tends to keep her Latias hidden to protect it. Extra Note: None of her party is actually "captured" by her yet. The Latias in the Masterball was bought from someone who didn't have much use for any type of Pokeball in the land they were in, and didn't realize there was a Pokemon already inside it (they likely assumed it was broken... I didn't play the vendor who 'sold it to me' in the RP). Geminai "Red" Kotone - She had the nickname Red through other means in past RP, and it has nothing to do with the Canon PKMN Trainer Red. Her party isn't set in stone except for possibly a Charmander or Charizard (depending on how long she's been on her journey), and she's supposed to have a destiny with a Reshiram. She's the most easy to mold character though at this point. Rain (Rocket Executive) - I usually play her as a very powerful trainer to the best of my ability, compared to any other character I play. She has a background in Team Rocket as being one who defeated Dark Lugia (kept for emergencies and for when a powerful Trainer really pisses her off or needs to be tested, she'll actually pull it off her belt... very few know she has actually captured it). Her main party needs to be rebuilt. She had a Shiny (not mega compatible) Charizard in the past. This is changeable. The biggest thing to expect of her though is she has a full, seasoned party. She is capable of going around in civilian clothes if needing to blend in and not pull Team Rocket into her appearances all of the time. New Trainer This doesn't necessarily mean "newbie" trainer setting out. It means if none of the ones I have used with friends in private RP are appropriate, I can figure something out with a new character that would meet the needs. I would probably use a Male "mid-journey" Ace Trainer. I'm looking for a casual rp - something to enjoy when I'm free. I don't really have any restrictions. I para rp, and I find that doesn't work with most rapid-fires. But I'm willing to give it a shot, either way. I'm willing to rp either here, in the forums, or in-world. My character will be Chale. She is more of a neutral/selfish alignment. I can't decide whether to have her just starting out in her journey, or having her a little ways along. Either way, she is from Saffron City, and enjoys fashion. She would possibly even be interested in Pokemon Contests. She enjoys catching Pokemon, but doesn't see the need for so many of the same kind, or even the ones she wouldn't really use. She sells her extras, of course keeping the best ones for herself. It could be that she's giving them another chance, or giving other trainers a chance with decent Pokemon. Or it could be for the change in her pocket. No one will know. She could be in business with Team Rocket, selling them Pokemon. Or she could be one of their operatives. The option is there, either way! Sounds like I could go with Cobalt and/or Raine depending on what's going on on a certain day and who's around. I used to love in-world RP. At the same time forum RP is a nice option due to mixed schedules. Posting in forums allows others to see it during times suiting for them. But Forum RP is much less likely to have a drop in than just being IC in world. I'll be up for either when I'm around. Hopefully some others pop up too! If you're comfortable with it, we could have two going. One here and one in-world? I'm good at keeping things separate between forums and in-world. Or I could even make a separate character for them! That's if you want to, of course. If not, I'm up for either.